From Goodreads: Solving Mossy Bog’s first fire fatality could net police officer Laurie Ann Dinterman the promotion she desperately wants. 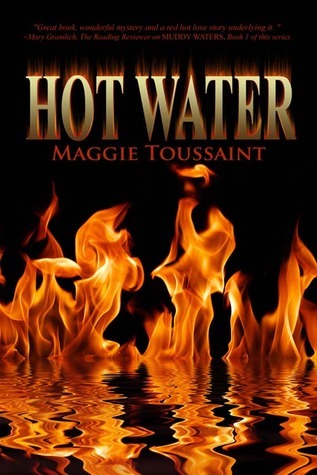 When the state arson investigator arrives to take over the case, Laurie Ann is assigned to give the man everything he needs while keeping him alive. The fact he’s the sexiest man ever to hit town shouldn’t make a difference. Hot on the trail of a serial arsonist, Wyatt North demands justice for his partner, the arsonist’s first victim. He’ll find the murderer or die trying–no matter how distracting the tall, lithe figure of his local partner is. As the investigation zeroes in on a suspect uncomfortably close to Laurie Ann’s life, her cop instincts conflict with her feelings for Wyatt. Worse, the arsonist will do anything to protect his identity. Can Laurie Ann accept the truth in time…or will she and Wyatt go up in flames? From Goodreads: Kathy Granite is not your ordinary writer. She’s a Weaver – a spinner of great tales and has the ability to write or rewrite the history of a world. Only one problem, she doesn’t know it. She’s spent the last six years telling the stories of people dragged to Earth from a variety of places by her Layren Protector, Ronon Wulfdrak. Ronon has spent that same time keeping Kathy in the dark and only brought her people who simply want their story told. He’s carefully chosen who would appear and even though she’s become quite the sensation in our world, she’s clueless as to her effect on any others. Ronon aims to keep it that way and hopes she’s safely hidden from his own people. For, if anyone finds out what she really is, they will tear her apart to get at her power. This book was awesome! I thought it was hysterical and it drew me in right from the very beginning. I’ve always loved books where the author is causing something or is involved in the story somehow. I think it’s so unique a concept and this one was better than any others with this kind of a situation. I loved the characters and I love the transformation Kathy goes through over the course of the story. I read it in almost one sitting because I didn’t want to stop. It’s a good sign when a book makes you want to ignore the rest of the world and this one succeeded. If you’re a fan of funny, fast-paced, well-written and interesting novels, then this is a good one for you. I’d recommend it to any fantasy fans. This is the second book I’ve read by this author and I loved both of them. I would be happy to read any books this author writes, so if there’s any more I hope I get a copy soon. 😉 Seriously, this is worth the read and I would definitely recommend it! From Goodreads: A woman on the run: Rustlers, claim jumpers, and fire—nothing will stop Kiera Alden from reuniting her family. But an accusation of murder threatens her dreams and sets Marshall Evrett Quinn on her trail. She may be able to escape prison bars and eventually prove her innocence, but she can’t escape Ev’s love. A lawman in hot pursuit: Marshall Evrett Quinn is relentless in pursuit of law-breakers, and pretty Kiera Alden is no exception. Clever and courageous, she evades him until a chance encounter turns the tables. Finally he has this elusive desperado under arrest, but success is bittersweet when she captures his heart. It's a basic 1-5 rating system but instead of stars I use cupcakes. The different colors represent the genre of the book. Disclaimer: Every book reviewed on this site is something that was sent to me for free or that I purchased myself. No money is given in exchange for a positive review. Paperbacks And Frosting is powered by WordPress with the Cupcake Love theme. | Subscribe to Entries and Comments.